Once, while interviewing search marketing meister Andy Crestodina, I declared “search engine optimization” is a misleading phrase. My POV is this: You don’t (or can’t) optimize the search engine. All you can optimize is the content you publish. Andy provided some precious and essential tips in that interview. Since then, I’ve paid close attention to advice content leaders in the search field have offered about search optimization for blog posts. One such leader is Alexa (yes, the Alexa ranking people). They’re actually an Amazon company. I saw Alexa marketing manager Jennifer Johnson had come up with a smart, four-phase approach in her post Blog SEO Tips: How to Write SEO Friendly Blog Posts, so I submitted my plea to the company to create an infographic based on it. The idea, of course, was to organize the information visually into its four phases and make it a simple resource for bloggers. 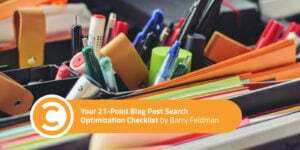 The result: Your 21-Point Checklist for Optimizing Blog Posts for Search. I love it. I think you will too. If you do, please share it.